With increasing higher education tuition rates giving rise to skepticism over the value of college degrees, many K-12 school districts are offering Career and Technical Education (CTE) programs that incorporate practical career-based skills to prepare students for a focused career path after high school graduation. CTE programs improve not only student engagement, but also increase students’ earning potential, and reduce dropout. In fact, students concentrating in CTE programs have a graduation rate 13% higher than the average national graduation rate. However, if poorly selected, CTE programs may inadvertently guide students into low-wage jobs or careers in declining industries. Here are three key research steps that districts should take to ensure CTE programs support student success. 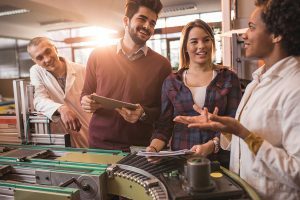 Choosing the right CTE programs to implement in a K-12 district relies heavily on understanding local and regional industry and employment trends. A CTE program can prepare students to be successful in one industry, but those efforts are fruitless if jobs are not available locally or even statewide. To avoid this issue, schools must analyze employment projections, identifying which careers have the strongest growth outlook locally, statewide and nationally. After gaining a better understanding of the most stable local and regional career options, schools should determine the typical certifications and levels of education or training needed to secure jobs in these in-demand careers. In practice, CTE programs should be tailored to prepare students with the job requirements for the most in demand careers. After gaining a deeper understanding of the labor market, the next step to ensuring successful CTE programs is to conduct a wage analysis. A wage analysis calculates typical wages for growing and in-demand jobs and identifies which jobs provide a living wage. Even if a career is in demand, a successful CTE program will steer students towards economically advantageous job opportunities that have solid earning potential for graduates. The final step in the process is to solicit feedback from all stakeholder groups, including students, parents, alumni, staff, local employers, and higher education institutions. Understanding how stakeholders view existing and proposed CTE offerings can help a district further tailor programming to the student body and ensure its overall success. Gathering this feedback is also an important opportunity for the district to positively market new and existing CTE offerings, gaining program advocates in the process. In this way, feedback acts as a natural advertisement for CTE programming while also helping districts ensure the programs fit the needs of the community.